UPDATE: The American government has made it possible, starting in 2012, to slaughter horses for human consumption within the United States. 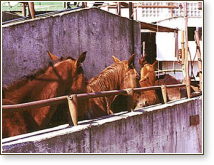 All horse slaughterhouses in the U.S. had been closed in 2007, and horses were shipped to Canada and Mexico for slaughter. The SAFE Act (Safeguard American Food Exports) 2013—2014 is the only hope to stop both the slaughter of horses within the U.S. and also their transport for slaughter outside the U.S. Please contact your Representative and your two Senators and urge them to become cosponsors of this crucial bill. Representatives who are currently cosponsors: H.R.1094. Senators who are currently cosponsors: S.541. The British media focus attention on one aspect of the racing industry that racegoers and the general public rarely consider: the slaughter of racehorses. In 2007, Animal Aid, an organization in the UK, released footage secretly filmed in an English abattoir. The exposé was covered in the British press. Other articles and videos also highlight this tragedy in England and elsewhere. British Members of Parliament have also addressed this issue. Read the complete article on the Animal Aid website. Read the complete article in PDF format. See videos and photos from the exposé. The slaughterman precariously balances a rifle against the small grey pony's head. Seconds later a shot rings out, the pony flails on the ground and is then winched onto a production line. The food and farming department, Defra, says the Taunton operation, together with another in Cheshire, kills 6,000-10,000 horses a year for consumption abroad. Animal Aid director Andrew Tyler said: "What all the former owners have in common is the transient use of their animal. They feel that their responsibility is relinquished once the horse or pony is of no further use to them. FSA (Food Standards Agency) statistics released to Sky News show a dramatic increase in the number of UK horses slaughtered every year, from 3,859 in 2007 to 8,426 in 2012. A report last year from the British Horseracing Authority (BHA) found: "The number of thoroughbreds reported dead to the Horse Passport Issuing Authority rose by 580—an increase of 29%—from 1994 to 2574 horses. "Of these, 1127 horses either in training, breeding or out of training were reported as killed in abattoirs—and reported to the Government Meat Hygiene Service —from 499 horses in 2010, an increase of 126%." Watch the video and read the complete article on the Sky News website. Racehorses are ending up on dinner plates overseas as the gruesome trade in horse flesh booms. Of the 17,000 thoroughbreds born last year, only about two-thirds will ever make it to the racetrack. As with cattle and other livestock, the most desired horse meat comes from younger animals in good condition and with quality muscle, and that means young thoroughbreds. Queensland vet Eva Berriman said young horses still in their prime were being killed for human consumption. "...The finger must be pointed firmly at the racing industry, which has a very high attrition rate of fine quality, well-muscled horses still in their prime, often with no road open to them except to a horsemeat abattoir," Ms Berriman said. There is only one organised horse welfare group in Australia, Cedar Springs Horses Inc, that rescues thoroughbreds destined for the slaughterhouse. Miss Stoikos [Cedar Springs Horses Inc] said the treatment of the doomed horses was horrific. "They can smell the blood and they are killed one after another and they can see the horse in front of them killed so they know what is going on. "The racing industry really turns its back on what happens to the horses." Read the complete article on the Sydney Morning Herald website. An undercover Observer investigation has revealed the shocking fate of thousands of British racehorses. Read the complete article on the Guardian/Observer website. Thousands of race horses are slaughtered every year — and they're the lucky ones. Five thousand racehorses end their careers each year. This excludes the 375 in an average year which are raced to death and the 4,000 foals which are considered not worth the expense of training. The owners of the 5,000 horses, which are increasingly often syndicates, usually sell up after the glory days end. Retirees meet several fates: leisure, neglect, or slaughter for pet food. What happens to thoroughbreds when they don't make the grade, or when owners and trainers judge them unfit for the track? This is about six years old for flat race horses, and about 12 for steeplechasers. "So few racehorses are heard of again after their careers are over," says John Francome, racing commentator and champion jockey. The fact is that we in this country do not eat horses. Many Committee members would not eat dogs or cats. Personally, I view eating horses as a revolting practice. Horses are companion animals, and we should not encourage that revolting practice in any shape, size or form. However, each year approximately 10,000 horses—a small proportion of the UK's one million horses—are killed in the UK and exported abroad to be eaten. 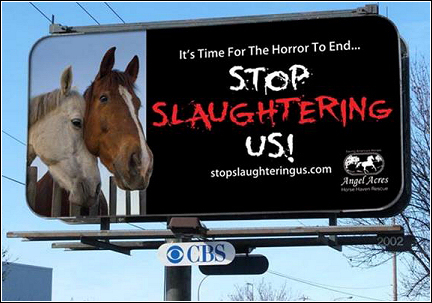 Nearly all the horses that go for slaughter are two or three-year-old racehorses that have been injured. James Gray is Vice-Chairman of the Conservative Back Bench Agriculture Committee, and the Conservative Back Bench Department of the Environment, Horse and Pony Taxation Committee. President of the Association of British Riding Schools, Honorary Associate of the British Veterinary Association, Consultant (unpaid) to British Horse Industry Confederation. Although it does not focus exclusively on racehorses, an article of interest about the slaughter of horses for meat throughout the world is Horse slaughter and horsemeat: the facts, by Dr. Eva Berriman. In the United States, horse slaughter has been banned — the last remaining horse slaughterhouses in the U.S. were closed in 2007. However, it is still legal to transport horses, many of them former racehorses, across the borders to Canada and Mexico, in brutal conditions, for slaughter there. One American horse is killed every five minutes for human consumption in Mexican and Canadian slaughterhouses. On 20 May 2008, Fox News aired a report on TV about the transport of horses from the U.S. to Mexico and their death in Mexican slaughterhouses. Included in the program was an interview with a Mexican veterinarian: "The method used to kill horses in most of the clandestine plants in Mexico, (all over the country) is by stabbing them in the spine until they are disabled. Then they are strung up from their hind legs and their throats are slit. Some others are killed by hitting them with a hammer on their heads, as well as donkeys and mules and most of them are skinned even if they are still alive." Read the complete interview in PDF format. One horse's experience of transport to slaughter: "Big winner nearly dies on the way to slaughter"
"All that money, nearly a half million dollars worth of racetrack winnings, couldn't help her as she thrashed in panic and fear. Flailing beneath the hooves of 30 other terrified horses, last December in a tractor-trailer heading for a Canadian slaughterhouse, once-winning race mare Press Exclusive had lost her balance on the truck, and her place in the world." "This report provides documentation of the numerous ways horse slaughter is inhumane. At the moment a horse is designated a 'kill horse' fated for slaughter, handling and treatment change radically from that normally given horses. A 'kill horse' is treated with disturbing cruelty, with high levels of violence and aggression, and with apathy and indifference even from those who would normally protect and advocate for the animal’s well-being. While cruelty and inhumane treatment immediately mushroom for these horses, concern for their safety, health and care are so diminished they are virtually nonexistent." Read the complete report, which has numerous explicit photos, in PDF format. If the racing industry is established in Israel, many former racehorses will inevitably be slaughtered — either within Israel or after transport to other countries for butchering there. THIS SHOULD NOT BE PART OF ISRAEL'S FUTURE. Another ugly phenomenon of the horseracing industry is the slaughter of "nurse-mare foals." After a racing mare is retired, her value depends entirely on being bred as often as possible: at her next heat, or 7–14 days after giving birth. In the United States, the Jockey Club (which sets the rules determining which horses may be registered as Thoroughbred) requires that Thoroughbred mares be impregnated physically by stallions (live cover) and not by artificial insemination. A mare must be shipped to the stallion for mating. Commonly the mare is nursing a foal, and that foal has monetary value. When the mare leaves to be bred to a stallion, her foal does not go with her. The journey is too dangerous for a newborn, and the insurance to cover a traveling foal would be too expensive. However, the foal must be nursed. Breeders lease wet nurses for this purpose. They are mares with no value other than to produce milk for another, more valuable, mare's foal. However, to be lactating, the nurse-mare will have a foal of her own. 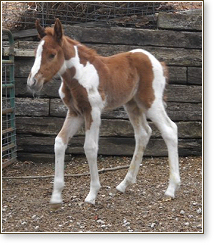 That foal, known as a "nurse-mare foal," has no monetary value. When that foal's mother travels away to feed a potentially valuable racing foal, the nurse-mare's foal will typically be killed for his or her hide ("pony skin"). A few very fortunate foals are purchased by sanctuaries, hand-raised until they are old enough to be adopted, then placed in homes.